We left Paris behind on a Saturday afternoon to start our adventure in the Champagne region. The trip only takes about an hour and a half but after taking it easy in Paris, we arrived in Reims around 5ish in the afternoon and everything seemed shut already. So we didn't bother with trying to visit any Champagne Houses. 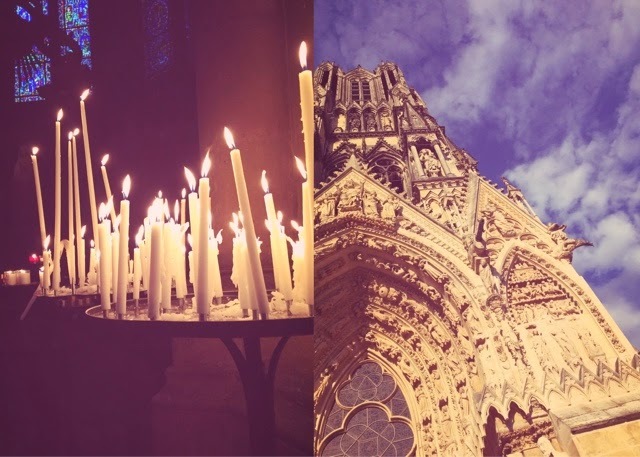 The impressive Reims Cathedral, that has hosted crowning ceremonies for most of France's monarchs. It took us two days to realise that all of the Champagne Houses in the area do not have info on their websites about visiting and even calling them doesn't get you far either. 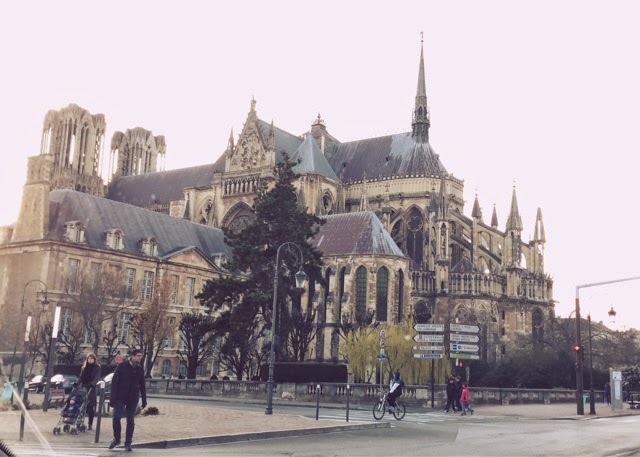 Your best choice is to walk into the Reims Visitor centre, just next to the Cathedral and get an update on all of the opening times, make appointments etc. The Vranken - Pommery House for example, stays open until 6 on most days. Since it was Saturday night, we walked around the town to find a nice spot for dinner. 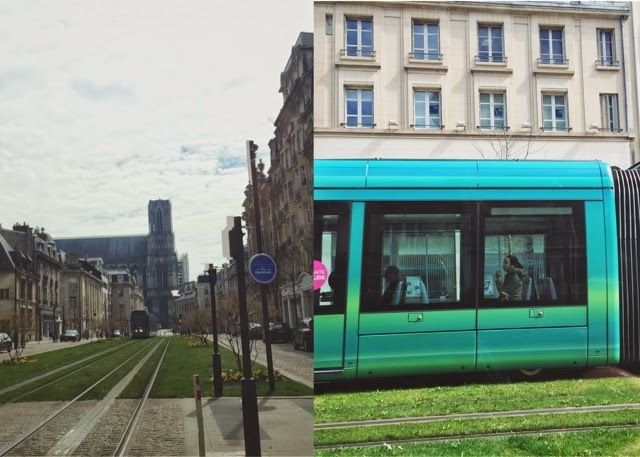 We were on our way to Café de Palais, just a stone's throw from the Cathedral for some nice croquet monsieur and a traditional brasserie setting. 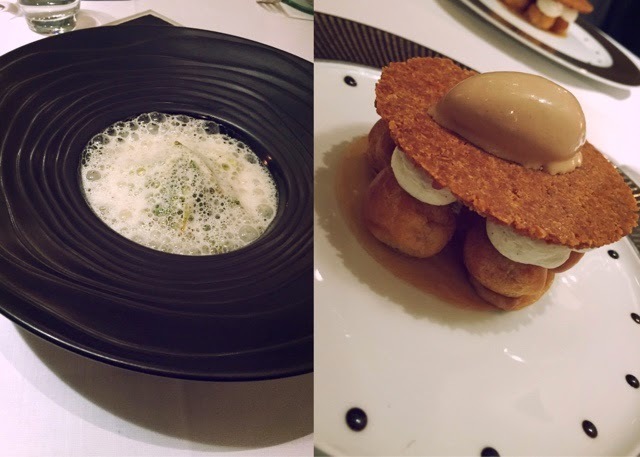 Instead we stumbled upon Le Foch, a Michelin star restaurant. Shall we give it a try? Let's! We were lucky to get the last seats in the house, Saturday night at 20:45 the place was already buzzing. Well, since it's a "grown up" establishment, maybe buzzing is not the right word but, it was full nevertheless, particularly with locals. Always a good sign in our book! The décor was a bit confusing with splashes of modern glass art-features and colourful wallpapers, certainly in need of updating or should I say, homogenising. We went for the Menu Degustation at 70 Euros each, plus wine. 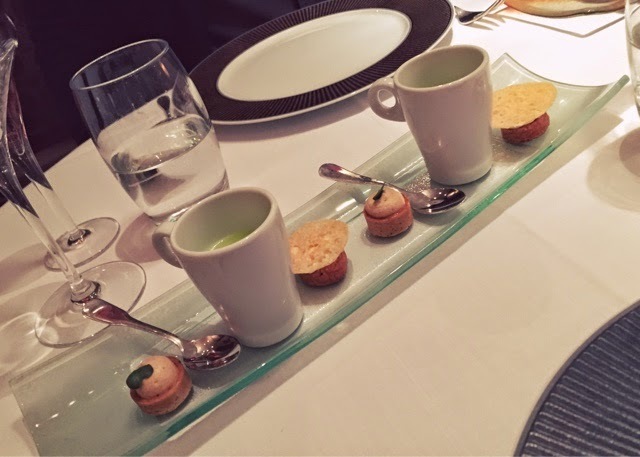 First up amuse-bouche packed with sharp flavours: a buttery cracker with an intense parmesan crisp topping and then a shortcrust pastry with fishy-fish mouse: wakey-wakey taste-buds! To smooth it all out last but not least, an espresso cup with a mint and pea mouse with cream cheese topping. yuzu being a Japanese mandarin hybrid. I expected intense flavours from this combo, which didn't really happen. My langoustine did arrive angry however, it was foaming! Clever presentation, I have to admit! My husband went for the "royal foie gras with asparagus and an emulsion of smoked eel" now that's a mouthful! He loved it but found it a bit too heavy for a starter because the foie gras was cooked. 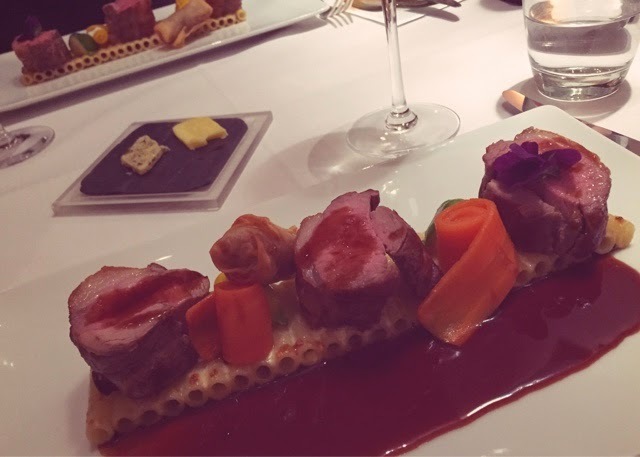 Then came the main; we both went for Provençale Lamb with parmesan macaroni. Sounds harmless right? Well, it was cooked to perfection and I rarely say that about lamb in restaurants. By mid-main we were both getting happily full, with three chunks of lamb on each plate. Did I mention the macaroni? It resembled rail tracks. I can imagine some poor sous-chef spending all of his morning setting out rows of macaroni, in perfect alignment. You have to suffer for your art, my friends! Suffering for our art came shortly after the main, in the form of cheese! 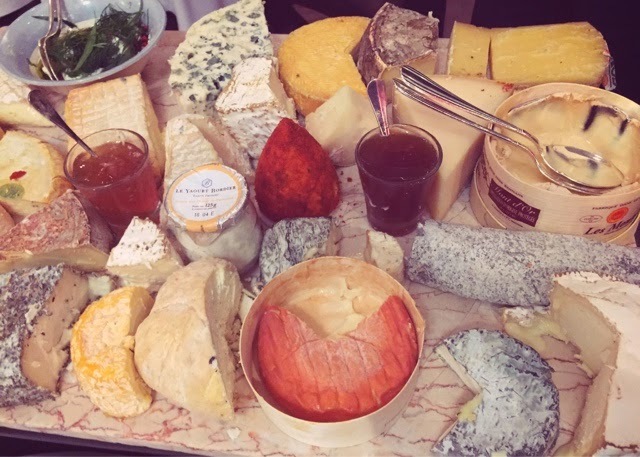 Oh my, how can you say no to this little treasure of local cheese? Amongst others we tried a local goats cheese, which resembled more of a creamy camembert but left your mouth numb after the first bite - it was very sharp. It went down a treat though with sweet sultana bread and hay chutney, yes hay! And then when the waiter proclaimed an orangey-looking cone "the smelliest cheese" in France, we just had to try it. Now, let me tell you that I LOVE cheese and the smellier, the better. This one however, smelled like death, in loss of a better description. And it wasn't the smell so much rather than the taste that hit you, very dense. Oh, we demolished it don't get me wrong. We are just not going to be looking for it in Carrefour on the way home! Left: royal foie gras with asparagus and an emulsion of smoked eel, Right: St Honore revisited! By now, we were suffering. But how can you say no to a "St Honore revisited"? Thin, crispy wafers sandwiching choux puffs and chiboust crème...lighter than air, my friends! Cheesy comment, sorry, it was delicious though and didn't help my suffering. Then came coffee and blue chocolate petit four to finish us off, smurf chocolate I called it! 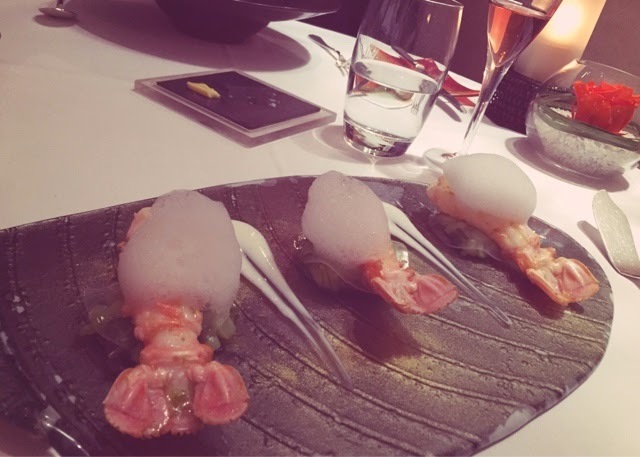 We always take Michelin star places with a pinch of salt, because we've had mixed experiences. This time the menu developed slowly but steadily both in flavour and presentation and we left thinking: money well spent!